How to Bullet proof Atari's AR2 (ARII) including the sense mod. 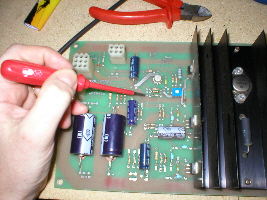 Roughly 30 minutes to perform the mods and an hour to an hour and a half to replace the components, depending on how good your soldering is. 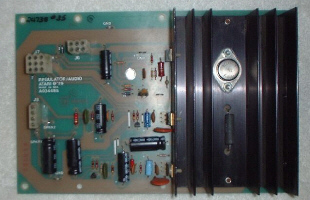 How to rebuild " Bullet proof " Atari's Audio Regulator pcb (AR II) including the Sense Mods. 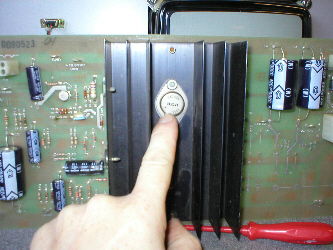 Atari's arcade cabinets came with either an AR I or an AR II Audio regulator pcb in them, which not only supplied amplification for the sounds of the games but also regulated the voltages needed for the game pcbs to run. 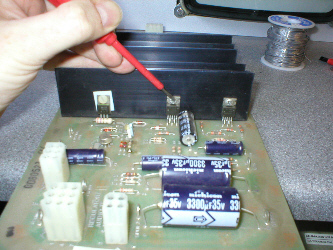 The regulator pcbs had + and - sensing circuits, which would sense and adjust the voltages being supplied to the game pcb, over time the components on this pcb deteriorate with age and can cause critical problems, by actually upping the voltage supplied to the game pcb so high that it kills components on the game pcb. This however can be avoided by some preventative maintenance. 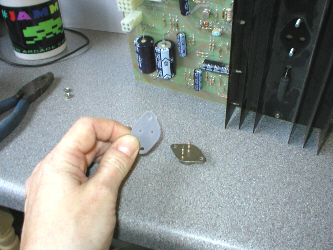 By rebuilding the Audio Regulator pcb and performing a few simple modifications known as the "Sense Mod" you can help to avoid catastrophic problems.
! 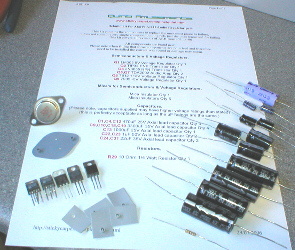 All notes here are for reference only, i will not be held responsible for any mistakes / damage done to your pcb's !
. 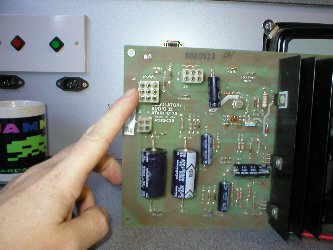 Both these pcbs come in a variety of different revisions depending on age and component population, but saying this they are all very similar and share the same sensing circuits. This is the AR II out of my Atari Star Wars and it has donated itself as a suitable candidate for rebuilding and even though it is working, it hasnt had the sense mods done yet and i have no idea how old the components are on it, so its time it had a bit of refreshing. I'm going to start by performing the sense mods first and then finish off with component replacement. As i have said before AR II's come in different populations and so some have more or less components on them than others, but they will all have the same basic components i am going to replace and will also all have the same sensing circuits that need to be modified. 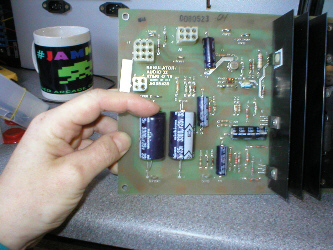 With the pcb facing me upright so i could read the Atari Audio II wording correctly and not upside down, i located connector J7 near the top left hand corner. 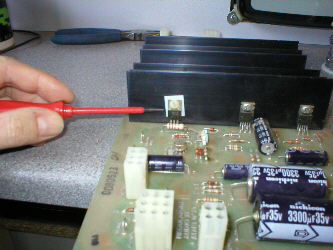 Here i am pointing at J7 and this is the connector where the sense mods need to be performed. It is the same for either AR I or AR II and has J7 marked next to it on the pcb itself. 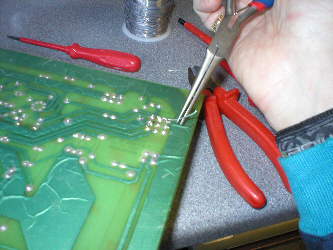 The modification needs to be performed to the solder side of the pcb, turning the pcb round i looked for the 9 solder blobs near to top right hand corner of the pcb. 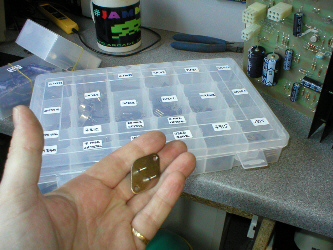 It is here that i am going to add some small jumpers across some of the solder pads. 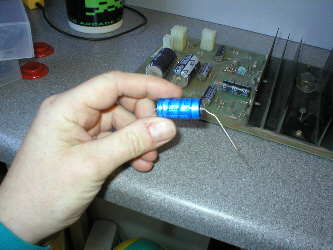 To make some neat jumpers you can use alot of different things, i tend to get an unused resistor or capacitor and cut its legs off, thus giving me some stiff but still flexible wire that is easy to grip and manipulate. I could of used regular wire, but as its stranded it can tend to get a bit fiddly when cut into very small lengths, plus you then have to remove its sheathing. 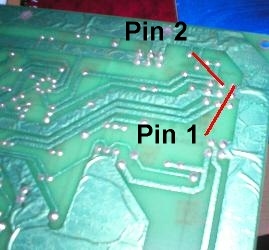 The first jumper wire i am going to add is from pin 6 to pin 3, if you look at the component side of the AR pcb you will see that pins 1, 4, 7 are numbered on the pcb next to the connector showing that the pins are numbered horizontally in three rows. 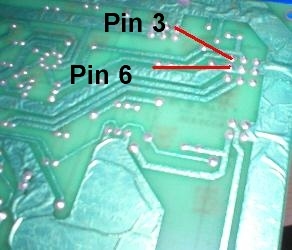 Which means that the pins (shown in pic 1 above) are pins 6 and 3. 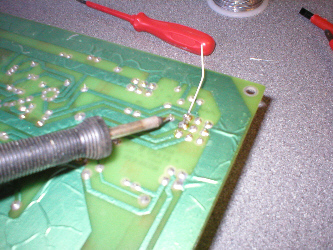 I started by adding just a little extra solder to the solder blobs on pin 6 and 3, then gripping the wire in a pair of long nose pliers i laid the end of the wire against pin 6 and heated the solder blob with the soldering iron untill the end of the wire is covered by the solder and then left it to cool. I could now grip the wire with the pliers in a different place and lay the wire against pin 3 and repeated the proceedure, i now have a wire link from pin 6 to pin 3 with the rest of the excess wire hanging over (shown in pic 2 above). 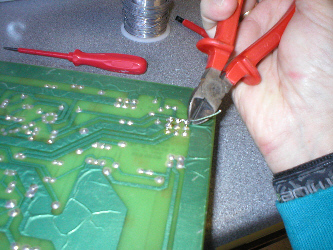 untill the end of the wire was covered by the solder and again left it to cool.
. Again i cut off the excess wire as close to pin 1 solder blob as i could using a pair of side cutters. I had now made the "Sense Mods", by adding the jumper between pin 6 and pin 3 i have modded the positive + sense circuit and by adding the jumper between pin 2 and pin 1 i have modded the negative - sense circuit. 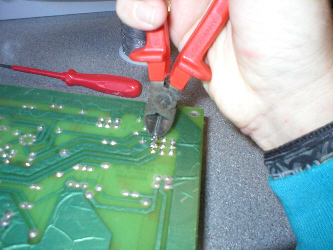 All this left me to do was make a good physical inspection of my work, to make sure i was happy with my soldering and more importantly to make sure none of the jumpers i had added were accidentally touching any other pins they shouldnt. 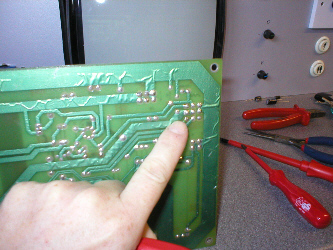 This check was critical, as any mistakes could cause damage to this pcb and possibly the game pcb, so it pays to double check ! As pic on left is not too clear, pic on right shows jumpers highlighted in red. 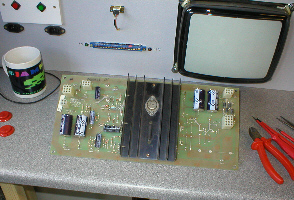 With the Sense Mods completed its now just a case of replacing the aging parts on my AR pcb, that in some cases may have been on there since 1979 ! 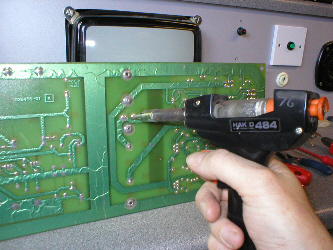 Replacing these parts will not only give an AR pcb a new lease of life, but help to prevent any future failures. Rebuild kits are Available here. 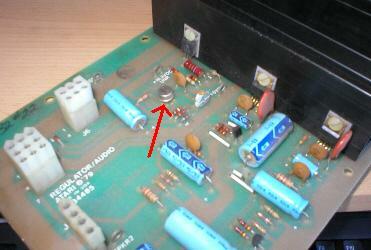 The Infamous R29 Resistor !